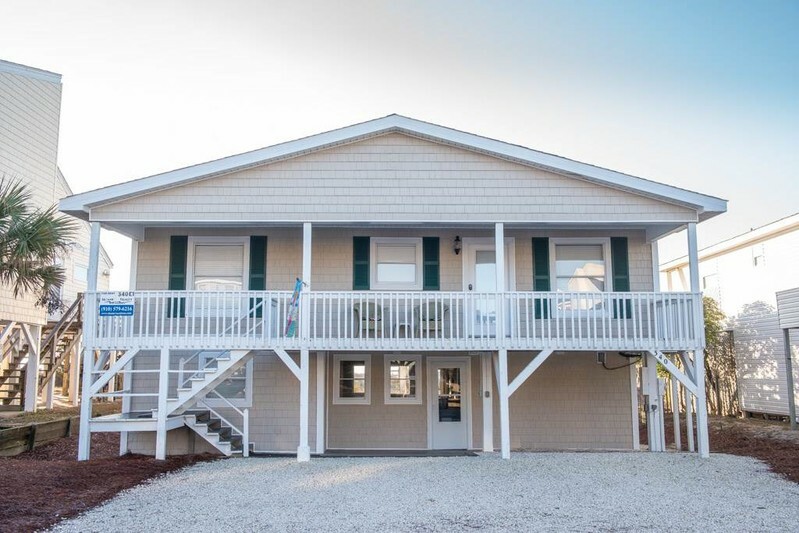 Cute and cozy OCEANFRONT 5 bedroom 3 full baths. Sleeps 18. Granite countertops and new cabinets in the kitchen, updated bathrooms, all new siding and exterior trim. Downstairs (not accessible from main home) has a separate entrance. The downstairs has an additional living area with television and queen size sleeper sofa; a single bed in the bedroom; and a full bath. Upstairs, guests enjoy a large open living space with lots of updates in the kitchen. Four bedrooms upstairs to sleep 15. Queen, Double/Single, 2 Doubles, 2 Doubles, QSS. Two full bathrooms upstairs. Open living area w/ well stocked kitchen, extra large dining room table to fit the whole family, small oceanfront sunroom, covered deck streetside, covered patio and sundecks overlooking the Atlantic Ocean, private walkway to the beach. Other amentities include flat panel TV in main living space, smaller TVs in bedrooms, Central Air, DVD players, washer/dryer, dishwasher, microwave, outside shower and private walkway to the beach. Non-smoking.